The retailer raised $122 million in its IPO, which priced at $24 a share -- the high end of its estimated range. It will use the bulk of the proceeds to pay down debt and pay management fees to its private equity owners -- Catterton, Tower Three and Glenhill -- who took the company private in 2008. 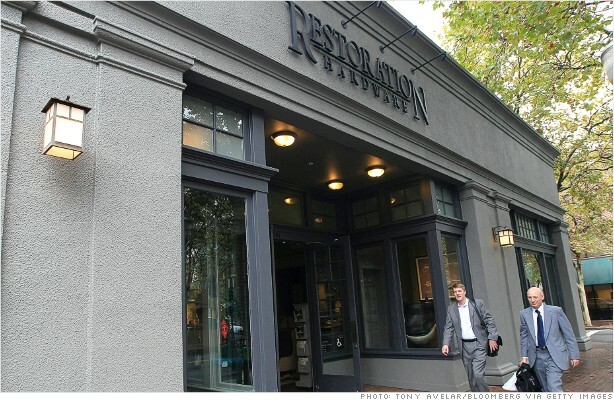 Restoration Hardware's stock opened 34% above its IPO price and shares were still going strong midday, at about $31.78. The retailer's stock closed its first day up nearly 30%. While still a relatively small player in the home furnishing world, Restoration Hardware's growth rate has been torrid over the past several years. The company operates 73 stores. And between 2009 and 2011, Restoration Hardware increased its net revenue by 53% and turned profitable, generating income of $49.3 million in 2011. Ahead of its IPO, the company's co-CEO and chairman Gary Friedman was forced to resign after an investigation by a special committee disclosed that he was engaged in a relationship with an employee. In a research note, IPO Boutique cited Friedman's resignation as both an operational risk and a potential ongoing legal liability. Two energy companies also debuted Friday -- Delek Logistics (DKL) and Southcross Energy (SXE). Shares of both companies jumped more than 10% Friday morning. After a slow 2011, IPO activity is picking up this year, with 121 companies going public so far this year. That's 22% more than this time last year, according to Renaissance Capital.